On the satellite position 28.2° East (also known as "Astra 2") you can find numerous television channels from Great Britain. Many of these stations do not use encryption. In return, however, they are not broadcast evenly across Europe, but are focused on the British Isles by a so-called spotbeam. A spotbeam doesn't mean reception stops right on the border. In the western third of Germany, British stations can still be received well, but further east reception is becoming increasingly difficult. The technology has evolved over the years. With each new generation of satellites, the confinement to Great Britain became stronger - and thus the reception of British channels in Germany was even more limited. Between 2013 and 2015, the current series of satellites called Astra 2E, 2F and 2G went into operation. Since then, reception has no longer been possible in the eastern third of Germany. After all, the current satellites have a planned service life of 15 years; it can now be assumed that the reception situation will not change significantly until 2028. Please remember that none of these maps are perfect. In practice, there can be all kinds of deviations. First of all, the covers of Astra 2E, 2F and 2G are not completely congruent, so it can happen that only a part of the transmitters can be received in the edge area. In the "FootPrints" column of the FlySat table you can see which channels are currently broadcast by which satellites. Critical are "2E UK", "2F UK" and "2G UK" - i. e. the UK spotbeams. On the other hand, the (few) stations whose footprint names contain the terms "Europe" or "Super" can be well received anywhere in Germany, even with smaller dishes. I read something about satellites called "Astra 2D" and "Astra 1N". What happened to them? They had reached the end of their lifespans and were shut down. Information concerning the reception of Astra 2D or Astra 1N is therefore obsolete. What do I need at best to receive the free British channels in Germany? You need a standard digital satellite receiver, an LNB and a satellite dish of the appropriate size. The minimum dish size depends on your location - see map and information above. Can I also receive German stations using the same dish? German channels are broadcast on another satellite position (19.2° East). By using "squinting" LNBs (multi-feed reception), both satellite positions can be received with a single dish and a single receiver. More detailed information on the technical implementation can be found on Einführung and on the Multifeed page (in German only). Which British channels can I receive unencrypted? Free satellite channels include BBC 1/2/3/4, ITV 1/2/3/4, Channel 4, E4, More 4, Film 4, Five, Five USA, Five Star, CBS Drama, CBS Reality, CBS Action, Horror Channel, True Movies 1/2, Movies4Men, Food Network UK, Travel Channel - and many more. For a complete list, visit freesat.co.uk. Will I not be able to watch any British channels if I live too far east? 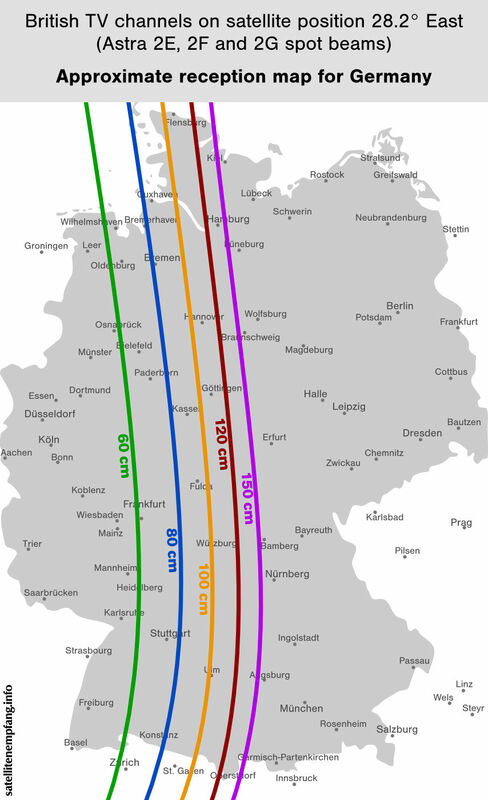 The channels which are broadcast on pan-European beams can also be received in eastern Germany with dishes starting at 60 cm in diameter. Their footprints in the FlySat table contain the terms "Super" or "Europe". Can I work around the problem by subscribing to Sky UK? Only partially. The free channels that are broadcast on the UK spotbeams (see above) cannot be received in the East - even with a Sky subscription. Unfortunately, meanwhile even about one third of the encrypted Sky channels are being broadcast on spotbeams. But the majority of Sky stations are still broadcast on the "Super" or "Europe" beams and can therefore also be received in the East (with a subscription). Are there also British radio stations via satellite? Yes, in addition to television channels, numerous radio stations are also available (see also freesat.co.uk). However, today many people find location-bound radio listening with a satellite receiver too cumbersome and are more likely to use Internet radio. In the UK, unencrypted satellite channels are advertised as a package called "Freesat", and dedicated Freesat receivers are available for purchase. But you can also receive the British channels with any standard receiver; the Freesat receivers are not mandatory. Which is better: regular receivers or the dedicated Freesat receivers? Both variants have advantages and disadvantages. The Freesat receiver is more convenient: it features a special EPG (electronic program guide) and updates itself automatically if stations are added or the reception data are changed. In addition, some Freesat receivers allow access to on-demand content from the Internet. However, the Freesat receiver can only be used for British channels. By contrast, with a regular receiver (or a television with integrated DVB-S tuner) you can receive both British and German channels. So you can use just one device for everything. To do this, you have to set the channels there manually and update them if necessary. Besides, you don't have an EPG for British channels. Are the British channels broadcast in HD quality? All free British channels are available in conventional SD quality. Some are also broadcast in HD. Some channels are free to air in SD, but only available in HD if you have a Sky subscription. What does the abbreviation +1 after a station name mean? Many of the British channels are being rebroadcast on a separate channel with a delay of one hour. If you missed something on the regular station, you can see it on the delayed channel (with the abbreviation +1 in the station name) one hour later. Is free reception of British channels legal in Germany? The providers try to limit reception outside the British Isles as much as possible with the help of a spotbeam. But if reception is still successful, e.g. with the help of an adequate large satellite dish, this is legal for the private user. Illegal would be the "cracking" of an encryption - but this is not necessary for the stations described here, since they are not encrypted at all.